Our Ego is our conditioning. That of which has a significant influence on us, what we have been trained or accustomed to accept as being the truth, about life. Our Soul is our inner authenticity. The undisputed origin of who we are. The bona fide and genuine Spirit that we were born with. The Ego seeks only to serve itself. Constantly searching for outward recognition. The Soul sees life as a gift. Count your blessings and recognize how it makes you feel! 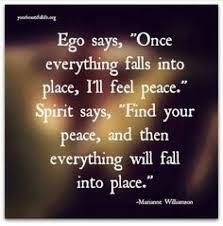 The Ego feels lack, always wanting and searching for more. It is never satisfied, constantly on the prowl to fill that empty space within its self. The Soul feels abundance. Simple things of life bring joy to the Soul. The Soul looks inward and knows eternal wholeness. The Soul is the cause of our healing, the very reason we are here on this Earth, to work towards peace and love. The Ego is the seeker of wisdom. Its good judgment is often disputed. Common sense is the Egos favourite expression. The Soul IS wisdom. The Soul has learned from past experience. The Soul has inner intelligence, and a sense of worth. The Ego knows only ‘Me’. The Soul embraces compassion, and knows only ‘We’.